CMC students won seven first place diplomacy awards—the highest award at the competition—and one second place verbal commendation. This year’s Model UN team was comprised of four seniors, five juniors, and two sophomores. 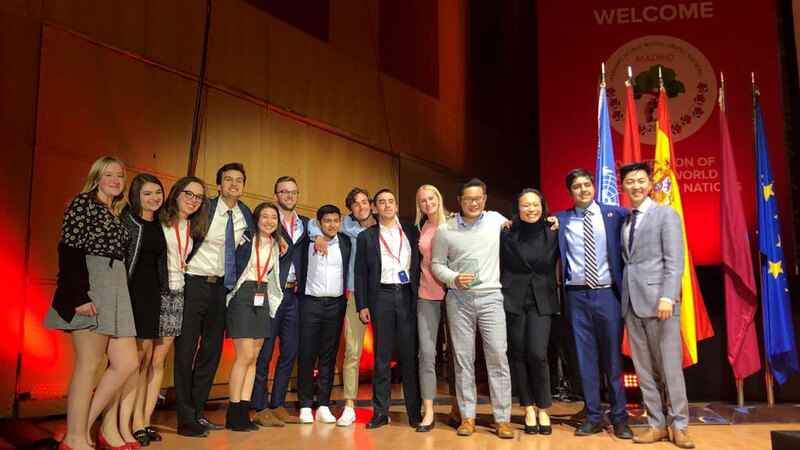 Zach Wong '19, Payson Ruhl ’19, and Nicholas Fedorochko ’19 served as head delegates, with Emma Houston ’19, Andrew Ciacci ’20, Ariana Kemp ’20, Ricardo Mateos Castanon ’20, Joseph Noss ’20, Gemma Sykes ’20, Sahib Bhasin ’21, and Cameron Hendrickson ’21 rounding out the squad. “I think the key to our success this year was the team's incredible focus and determination. Our team is always fun and constantly laughing together, but when we turned our focus to preparation or competition, everyone was honed in on our singular goal of winning,” Wong said. “I'm grateful and proud of every member of our team for really giving their all to the conference. It's not easy—the schedule is demanding; I averaged four-and-a-half hours of sleep throughout the week—but everyone rose to the challenge, and our success is a simple sum of their individual achievement." Billed as “the Olympics of Model United Nations,” WorldMUN is one of the largest international Model UN competitions. More than 2,000 delegates from 110 countries competed at the 2019 event.